The eight RAF Tornado GR.Mk 4s deployed to RAF Akrotiri, Cyprus, for Operation Shader returned to RAF Marham on February 4 and 5, marking the end of the type’s operational flying career in UK service. Limited training will continue until the Tornado’s official out-of-service date at the end of March. Air Marshal Stu Atha, the RAF’s DCOM Ops (Deputy Commander, Operations) commented, “An aircraft designed in the Cold War has been used in a succession of hot wars. And for the last four and a half years it has been operating in the most challenging operational environment.” He further noted that, apart from a brief 18-day period in 2009, the Tornado Force had been continually deployed on operations since August 1990, including missions in the Gulf, the Balkans, and Afghanistan. On January 31, the Tornado Force flew its final operational sortie on Operation Shader. The lead aircraft was crewed by Wing Commander James Heeps, Officer Commanding No. IX Squadron and Wing Commander Matt Bressani, OC No. 31 Squadron. The two aircraft flown on this mission were each armed with three Raytheon UK Paveway IV dual-mode bombs and carried Litening III laser designator pods and 595-U.S. gal (2,250-liter) "Hindenburger" fuel tanks. No weapons were dropped on the sortie, and the last weapon dropped by Tornado was expended on January 28. The last mission using the Goodrich/UTAS (now Collins Aerospace) DB-110 Raptor reconnaissance pod was flown on January 27. Operation Shader—the UK element of the international campaign against Daesh—began on Sept. 26, 2014, following a formal request for assistance by the Iraqi government. Tornado GR.Mk 4s had already been deployed to help coordinate RAF airdrops of humanitarian relief using their Litening III targeting pods. They began flying armed sorties immediately after the House of Commons voted to authorize British airstrikes against Daesh in Iraq on September 26. The first airstrike took place on Sept. 30, 2014, when a pair of Tornados attacked a Daesh heavy weapons position using a Paveway IV laser-guided bomb, and an armed pickup truck using a Brimstone missile. Initially six Tornado GR.Mk 4s were stationed at RAF Akrotiri in Cyprus, forming the offensive backbone of No. 903 Expeditionary Air Wing. Two further Tornados were deployed on Oct. 3, 2014, bringing the total number of combat aircraft deployed on Operation Shader to eight. From October 2014 the Tornados were augmented by an undisclosed number of General Atomics MQ-9 Reaper unmanned combat aerial vehicles, operating from Ali-Al Salem airbase in Kuwait. The Reaper conducted its first airstrike on Nov. 10, 2014. 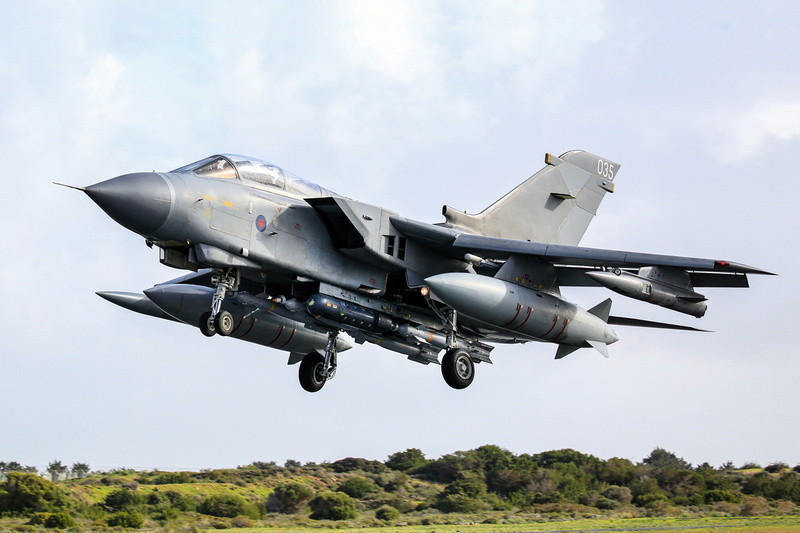 Tornados began attacking Daesh targets in Syria on Dec. 2, 2015, and the then-Defence Secretary Michael Fallon subsequently announced that the Royal Air Force would deploy six Eurofighter Typhoons and two more Tornado GR.Mk 4s to bolster the force. Although the tempo of operations varied during Operation Shader, No. 903 Expeditionary Air Wing would typically launch a pair of Typhoons and a pair of Tornados in the morning, and another two pairs in the afternoon, six days per week. No. 903 EAW normally launched Typhoon pairs and Tornado pairs as a standard tactical formation but would occasionally launch a mixed Typhoon/Tornado pair, usually as a result of Tornado unserviceability. During Shader the Tornado flew 30,000 hours, dropping nearly 2,000 weapons, including Storm Shadow, Dual Mode Brimstone and Brimstone 2, Enhanced Paveway II, Paveway III, and Paveway IV, as well as firing the internal 27-mm Mauser cannon.